Brent Marshall with an 11.6lb sea-sea-run brown trout from the Taieri River, just south of Dunedin. The birds were singing their song, our feet were damp from the morning dew. We fumbled through our tackle boxes, wandering and thinking hard what would be on the menu today – hopefully, sea-run trout! I decided on a brown Mrs Simpson which in the past has done well in this stretch of the lower Taieri River. While tying on the lure I heard the familiar sounds of fish rising behind me. This caused me to increase speed and the heart rate to creep up another notch or two. Jacket on, waders, hat, and sunglasses soon followed. I slowly made my way down to the water’s edge. There I crouched behind a bush to plan my attack. I decided to crawl up to the next pool where I saw a large swirl earlier on. As I got closer I saw a large fish just lying on the gravel bottom beating its tail slowly. I knew that I had a good chance of at least getting one strike from this fish. I couldn’t really tell its weight, but I was certain it was a big fish! The sun was just starting to climb the hill as I started to pump line. The line landed a bit heavy and I thought I’d blown it but the fish didn’t even budge. So out goes the line again. It was a better cast than the first one, which had been too short. My eyes were fixed on the indicator as I gave the line a couple of twitches when suddenly all hell broke loose. The indicator shot down and the fish leaped high into the air and crashed down breaking the glassy surface. That was the first time I had a good look at the fish and I knew it wasn’t your average trout. The size and power of this fish was incredible. It was my first sea-run trout. Sadly, however, I lost it about twenty minutes into a hard fight. That was a few years ago. Since my ﬁrst experience with that sea-run trout I have caught a few more and they are still one of my favourite fish to hunt. I’m sure many anglers would agree, that these fish look like a salmon, fight like a kahawai, and jump like a rainbow. 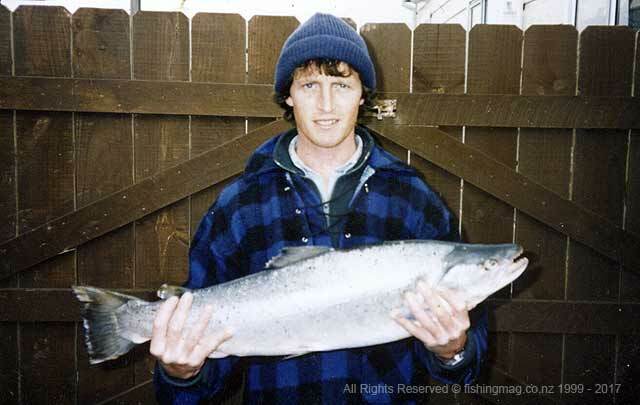 l have caught sea-run brown trout in the Shag, Taieri, Toko and Clutha Rivers. These waters are all close to Dunedin. The stretch between Outram and the Taieri mouth, I have found to be the most fruitful sea-run trout country for me. l have heard of sea-run fish being caught as far up as Middlemarch. Introduced during the 1870s in the southeast of the South Island, they have relished the New Zealand conditions. After their first two years of life in a freshwater stream, the young fish, belonging to the saltwater strain, follow the urge to migrate down to the tidal water and into the sea. They live in the sea until it’s time for their next spawning migration. In this procedure, they imitate very closely the habits of the salmon. Like the salmon they pass through the stages from smolt, to sea feeding fish, to fresh run fish just returned from the sea with all the salmon-like beauty and fighting vigour, and then on to dark coloured spawning fish that are unattractive to the eye. The point that seems to be of most importance is this behaviour, this desire and decision in the mind of the young sea-run fish that prompts its seaward migrations must be an inherited characteristic. It can’t be the environment because it doesn’t affect the ordinary resident brown trout living in exactly the same water. Besides, there is something more than this, so to speak, just before they start to descend the river on their way to the sea the young ﬁsh that are of the saltwater strain take on the bright silvery appearance which is also typical of the salmon smolt. Sea-run trout smolts are commonly called yellowfins because it is usually the breast fins which distinguish them from salmon smolts when they are seen in the water. Fish & Game Otago fishing locations and access brochures. As for the present day conditions in Otago waters, I think it is possible that the original strain of sea-run trout which probably existed in the past has been more or less mixed with the brown trout strain and that we now have a number of hybrids between the two originally distinct strains. From what we know of the effects we may expect that some of the fish of the mixed strain would still have the same urges to migrate. Only one criterion that could be used to prove that a fish belongs to the sea-run trout category. 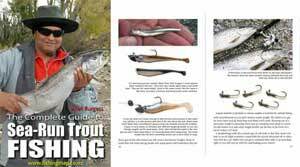 If you find a river where the general stock exhibits the normal brown trout characteristics, a young trout that has turned silver before it leaves the fresh water, that fish is thereby identiﬁed as a sea-run trout smolt possessing the inherited characteristics of the sea-run trout. 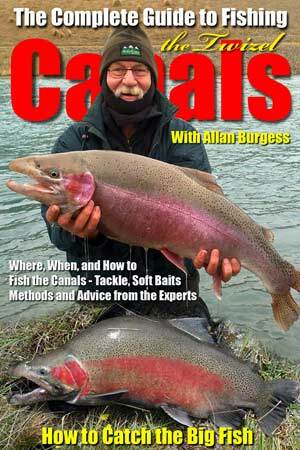 All the sea-run trout that l have caught have been thoroughbreds but I would be interested to hear from any anglers who have caught crossbreeds. More on sea-run brown trout in Sea-Run Brown Trout Video – migrate to sea but spawn in rivers. 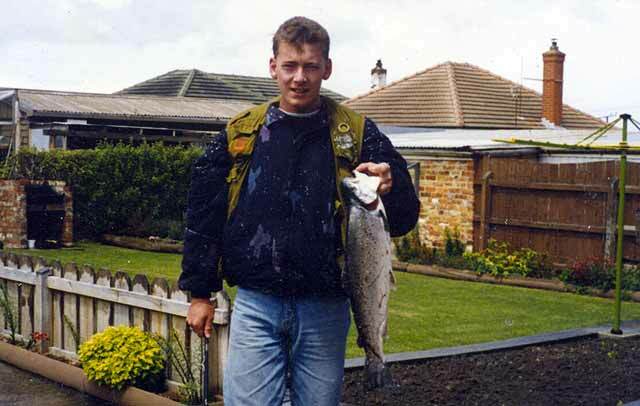 Brad Martin with a 7lb sea-run brown trout also from the Taieri River.